P&O Cruises is a British cruise line based at Carnival House in Southampton, England, operated by Carnival UK and owned by Carnival Corporation & plc. Originally a constituent of the Peninsular and Oriental Steam Navigation Company, P&O Cruises can claim to be the oldest cruise line in the world, its predecessor company having operated pleasure trips since 1844 and the world's first dedicated cruise ship in 1881. It is the sister company of, and retains strong links with, P&O Cruises Australia. P&O Cruises was de-merged from the P&O group in 2000, becoming a subsidiary of P&O Princess Cruises plc, which subsequently merged with Carnival Corporation in 2003, to form Carnival Corporation & plc. 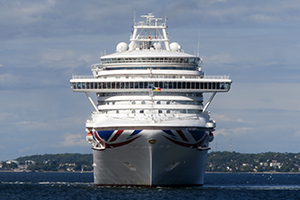 P&O Cruises currently operates seven cruise ships and has a 2.4% market share of all cruise lines worldwide. Its most recent vessel, flagship Britannia, joined the fleet in March 2015. The original company originates from 1822, with the formation of the Peninsular & Oriental Steam Navigation Company, which began life as a partnership between Brodie McGhie Willcox, a London ship broker, and Arthur Anderson, a sailor from the Shetland Isles. The company first operated a shipping line with routes between England and the Iberian Peninsula, adopting the name Peninsular Steam Navigation Company. In 1837, the company won a contract to deliver mail to the Peninsula, with its first mail ship, RMS Don Juan, departing from London on 1 September 1837. The ship collected mail from Falmouth four days later, however it hit rocks on the homeward bound leg of the trip. The company’s reputation survived only because all objects including mail were rescued. In 1840, the company acquired a second contract to deliver mail to Alexandria, Egypt, via Gibraltar and Malta. The company was incorporated by Royal Charter the same year, becoming the Peninsular and Oriental Steam Navigation Company. At the time, the company had no ships available to use on the route, so agreed to merge with the Liverpool based Transatlantic Steamship Company, acquiring two ships, the 1,300-ton Great Liverpool and the newly built 1,600-ton Oriental. P&O first introduced passenger services in 1844, advertising sea tours to destinations such as Gibraltar, Malta and Athens, sailing from Southampton. The forerunner of modern cruise holidays, these voyages were the first of their kind, and have led to P&O Cruises being recognized as the world's oldest cruise line. The company later introduced round trips to destinations such as Alexandria and Constantinople and underwent rapid expansion in the later half of the 19th century, with its ships becoming larger and more luxurious. Notable ships of the era include the SS Ravenna built in 1880, which became the first ship to be built with a total steel superstructure, and the SS Valetta built in 1889, which was the first ship to use electric lights. In 1904 the company advertised its first cruise on the 6,000-ton Vectis, a ship specially fitted out for the purpose of carrying 150 first-class passengers. Ten years later the company merged with the British India Steam Navigation Company, leaving the fleet with a total of 197 ships. In the same year, the company had around two-thirds of its fleet requisitioned for war service. However, the company was fortunate and only lost 17 ships in the First World War, with a further 68 lost by subsidiary companies. A major event in the company’s history took place in December 1918, when P&O purchased 51% of the Orient Steam Navigation Company, which had been previously operating jointly with P&O on the Australian mail contract. During the 1920s, P&O and Orient Line took delivery of over 20 passenger liners, allowing them to expand their operations once again. Cruises began operating once again in 1925 when Ranchi’s maiden voyage was a cruise to Norway. During 1929, P&O offered 15 cruises, some aboard Viceroy of India, the company’s first turbo-electric ship. The P&O Group left the Second World War with a loss of 156 ships including popular liners such as Viceroy of India, Cathay, Oronsay and Orcades. By the late 1940s, commercial aviation was beginning to take hold of the industry so newer ships became larger and faster, allowing the sailing time to Australia to be cut from five to four weeks. In 1955 P&O and Orient Lines ordered what were to be their last passenger liners — the Canberra and Oriana. These fast ships bought the Australian run down another week to just three, with Oriana recording a top speed of just over 30 knots during trials. During 1961, P&O bought out the remaining stake in Orient Lines and renamed its passenger operations as P&O-Orient Lines. The decreasing popularity of line voyages during the 1960s and 1970s meant that cruising became an important deployment for these ships in-between line voyages. In 1971 the company reorganized its 100 subsidiaries and 239 ships into several operating divisions, one of which was The Passenger Division which began with 13 ships. The 1962 comedy film, Carry On Cruising, based on the original story by Eric Barker, listed P&O-Orient in its credits. The first Carry On film in color, it used footage of P&O's cruise ship S.S. Oronsay as well as mock-up scenes shot at Pinewood studios. The 1970s was a grim time for the passenger liner as many fairly new ships were sold for scrap. Princess Cruises was acquired in 1974 which allowed the almost new Spirit of London to be transferred to the Princess fleet. This left Canberra and Oriana to serve the UK market on their own, with Arcadia deployed in Australia and Uganda offering educational cruises. In 1977, P&O re-branded its passenger division, creating P&O Cruises and P&O Cruises Australia. In February 1979 Kungsholm, a former Swedish American Line vessel, was acquired from Flagship Cruises and after a major refit was renamed Sea Princess. Operating out of Australia, she replaced Arcadia that was then sold to Taiwanese ship breakers. In spring 1982 Oriana replaced Sea Princess in Australia, leaving Sea Princess to be transferred to the UK. After Canberra returned from the Falklands War, Sea Princess was switched to the Princess fleet in 1986 leaving just the Canberra for the UK market. With Canberra's withdrawal becoming ever more imminent, P&O ordered its first new ship for the British market, the 69,153-ton Oriana, delivered in 1995. Canberra ran alongside her for two years until she was scrapped in 1997. Canberra was replaced by Star Princess, renamed Arcadia. She became the first ship in the P&O fleet to be dedicated for adults only, a role that would be continued by various ships thereafter. 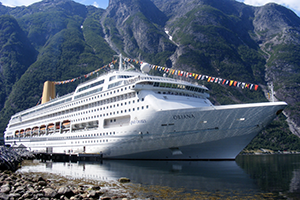 In April 2000, Aurora, a half-sister ship to Oriana, entered service for P&O Cruises. In February 2000, it was announced that all cruise ship operations, including P&O Cruises, were to be de-merged from the P&O group, forming a new independent company, P&O Princess Cruises plc. The company operated the P&O Cruises, Princess Cruises, P&O Cruises Australia, AIDA Cruises and later A'Rosa Cruises and Ocean Village fleets. In 2003, P&O Princess merged with Carnival Corporation, to form Carnival Corporation & plc. In 2003, Arcadia was transferred to the new Ocean Village brand. At the same time, Oceana (ex Ocean Princess) and her sister the Adonia (ex Sea Princess) were transferred to the P&O fleet. Following the merger with Carnival Corporation, Oceana remained with P&O Cruises and Adonia was transferred back to Princess Cruises in 2005 when she was replaced by the new Arcadia, a newbuild originally intended for Holland America Line, and later Cunard Line. Another former Princess ship, Artemis, joined the fleet in 2005 and left in 2011 to be replaced by yet another former Princess ship, the second Adonia. P&O Cruises continued to expand its fleet with the addition of the 116,017-ton Ventura in 2008, and her near-twin sister Azura in 2010. In January 2014, the line introduced a new fleet-wide livery, based on the Union Flag, to emphasize their British heritage, shortly after which, a new 143,730-ton flagship, Britannia, joined the fleet in 2015. In September 2016, it was announced that P&O Cruises would build a new 180,000-ton ship in 2020, and in January 2018, it was announced that a twin sister would follow in 2022. These ships would be the UK's first to be powered by liquefied natural gas (LNG), shipping’s most advanced fuel technology, with the intention of reducing air emissions. In May 2018, it was announced that the first of the two ships would be called Iona. Adonia left the fleet in March 2018, and in June 2018, it was announced that Oriana would follow in August 2019. P&O awards the company’s Golden Cockerel trophy to the fastest ship in its P&O Cruises fleet. The current trophy holder is Oriana. Previously held by Oriana of 1960, it passed to Canberra upon the retirement of Oriana in 1986. On the final cruise of Canberra in 1997, the Golden Cockerel was handed over to the new Oriana, when both ships were anchored off Cannes. Oriana. Built: 1995. In service for P&O Cruises: 1995–present. Gross tonnage: 69,153. Refitted in 2016. Due to leave the fleet in August 2019. Named by Her Majesty the Queen. Aurora. Built: 2000. In service for P&O Cruises: 2000–present. Gross tonnage: 76,152. Refitted in 2014. Named by HRH The Princess Royal. Oceana. Built: 2000. In service for P&O Cruises: 2002–present. Gross tonnage: 77,499. Previously Ocean Princess for Princess Cruises. Refitted in 2017. Arcadia. Built: 2005. In service for P&O Cruises: 2005–present. Gross tonnage: 84,342. Previously intended for Holland America Line and Cunard Line. Refitted in 2017. Named by Dame Kelly Holmes. Ventura. Built: 2008. In service for P&O Cruises: 2008–present. Gross tonnage: 116,017. Refitted in 2018. Azura. Built: 2010. In service for P&O Cruises: 2010–present. Gross tonnage: 115,055. Refitted in 2015. Britannia. Built: 2015. 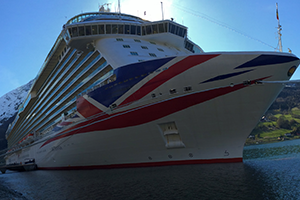 In service for P&O Cruises: 2015–present. Gross tonnage: 143,730. Flagship. Largest cruise ship ever built for P&O Cruises and the UK market. Iona. Built: 2020. Gross tonnage: 183,900. Will be both the largest cruise ship ever built for P&O Cruises and the UK market, and the first to run on liquefied natural gas. Unnamed. Built: 2022. Gross tonnage: 183,900. Will be the joint-largest cruise ship ever built for P&O Cruises and the UK market.